Samsung today announced the SGH-D500, a high-end slide style mobile phone. 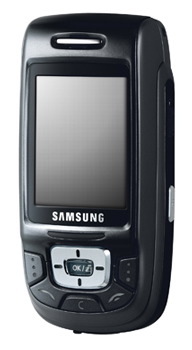 The Samsung SGH-D500 includes many features that are not uncommon but have eluded Samsung phones until this point (Bluetooth, shared memory etc). Here are the specs: * 1.3 megapixel camera with video capture and 7x digital zoom * Bluetooth * GSM 900/1800/1900 * 176x220 pixel 262,000 color TFT display * 80MB memory * Speakerphone * MP3 / AAC player * Weight : 99g Look for the Samsung SGH-D500 by the end of the year. Carrier availability and pricing were not announced. Click on thumbnail at right to enlarge. Another photo is available after the jump.